Ten Speed Press, 9781607746393, 144pp. 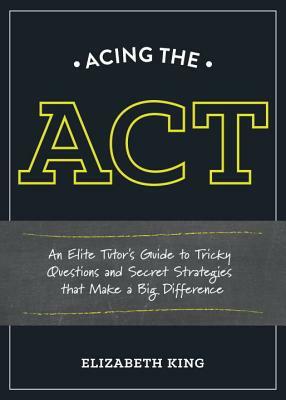 A streamlined prep guide for the ACT featuring concise lessons that will boost scores dramatically by teaching students how the questions are asked and the best strategies for getting to the right answer quickly. make your score pop, even if you’re already a top scorer. Whether you’re studying months ahead, or prepping last-minute, Acing the ACT delivers higher scores, fast. ELIZABETH KING is the author of the SAT prep book Outsmarting the SAT and the provocative culture and arts blog Stay Out of School. She is founder and president of the online boutique test prep firm Think Tank Education International, Inc. Find her at elizabethonline.com.